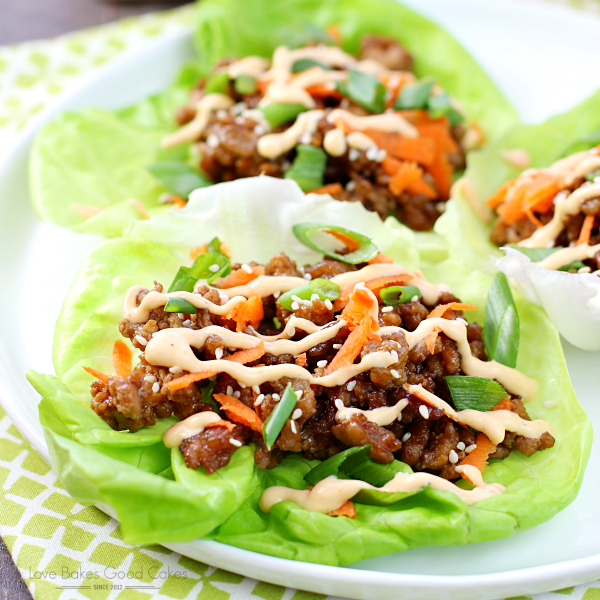 Get dinner on the table in a jiffy with these Asian Pork Lettuce Wraps! It’s a simple, satisfying meal the entire family will enjoy! Brian and I are in the process of trying to figure out what we want to do with our backyard. We’ve had a few ideas but we haven’t really solidified anything …. we have too many ideas and not enough room for everything! We’ve tossed around the idea of having some sort of patio area so we can enjoy dinner (or morning coffee) outside – and although we’ve pretty much decided we need an area like that, we don’t agree on where it should be or if it should be concrete or pavers. We’ve also talked about adding a fire pit area and a small gardening bed. To be honest, most of our hold-up is contingent on where that seating area goes …….. because everything else has to be planned around it. We’ve spent countless days looking for ideas and trying to decide what we want to do. And too many times, time just gets away from us. Before we know it, we have spent half of the day walking around gardening stores or home improvement stores and we’re not any further along in decideing what we want to do than when we started. Too many times after days like this, I am too drained to even begin to think about anything else …. and I really don’t want to spend a lot of time cooking dinner. After one of our excursions to look at patio pavers and rock, I realized that I forgot to get anything out for dinner. Not really wanting to hit a drive-thru, we stopped at Walmart so I could pick up a few things for dinner. I usually do most of my grocery shopping at Walmart – I love one-stop shopping where I can find everything that I need from housewares, toys, electronics, health and beauty – and I can even get my oil changed while I shop! Plus, with Walmart’s grocery department, it makes it super easy to create simple and delicious meals! I originally planned on making a Grilled Chicken Salad – something quick and easy! I was on the condiment aisle looking for our favorite Hidden Valley® Ranch dressing, and I spotted some new flavors! Have you seen them yet?! 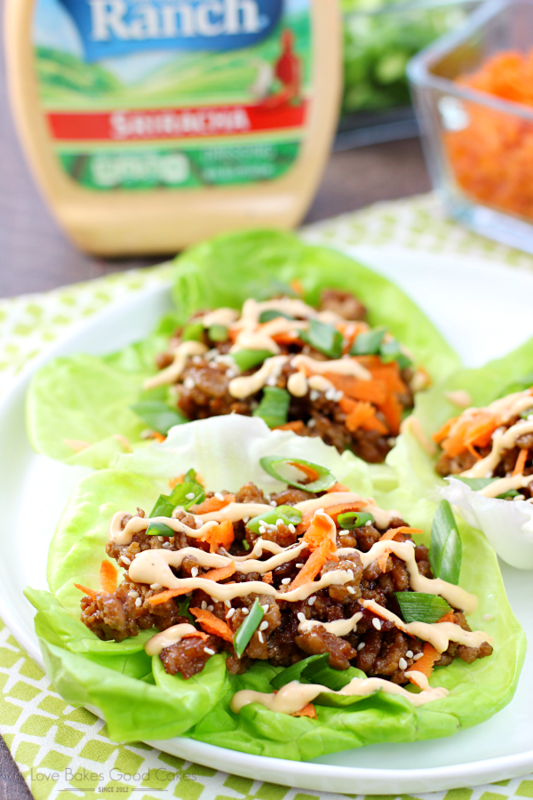 There are four new varieties that are sure to add tons of flavor mealtime! I don’t know about y’all, but I have tons of ideas on how I can use these new Hidden Valley® Ranch products! 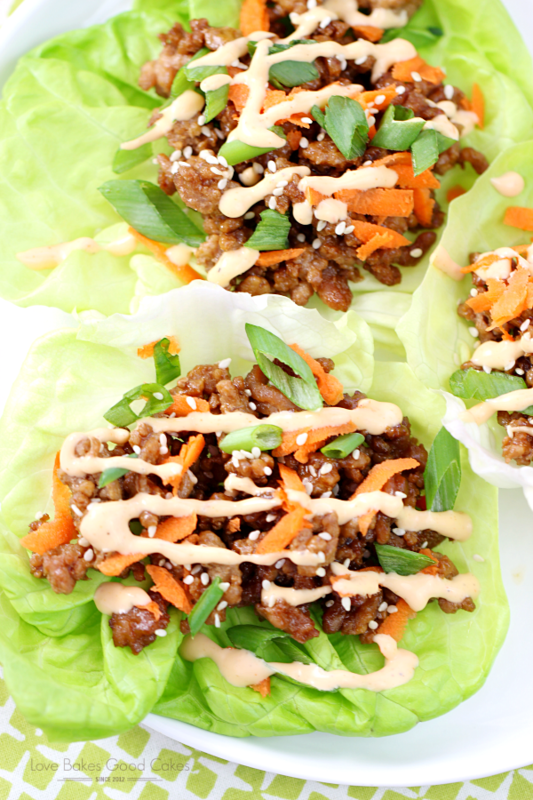 I picked up a bottle of the Hidden Valley® Ranch Sriracha because I thought it would be great with our Asian Pork Lettuce Wraps – and just like that, our menu for that night switched from salad to the Asian Pork Lettuce Wraps! And let me just say, I was right!! 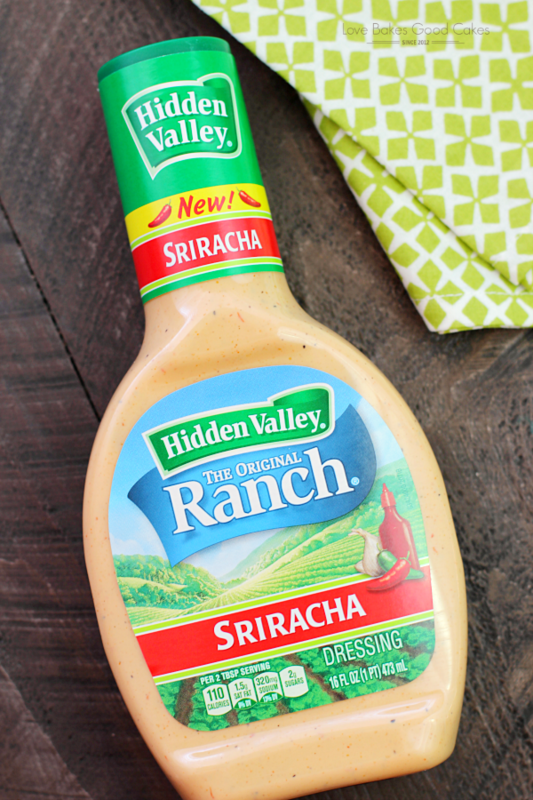 The Hidden Valley® Ranch Sriracha was the perfect touch to our already great recipe! I’m already planning on picking up a bottle of the Hidden Valley® Ranch Cilantro Lime on my next trip to Walmart! Before you head to Walmart to pick up your favorite new Hidden Valley® Ranch product, be sure to get your coupon for 75 cents off of any 12 oz. or 16 oz. bottle of Hidden Valley® Ranch dressing! 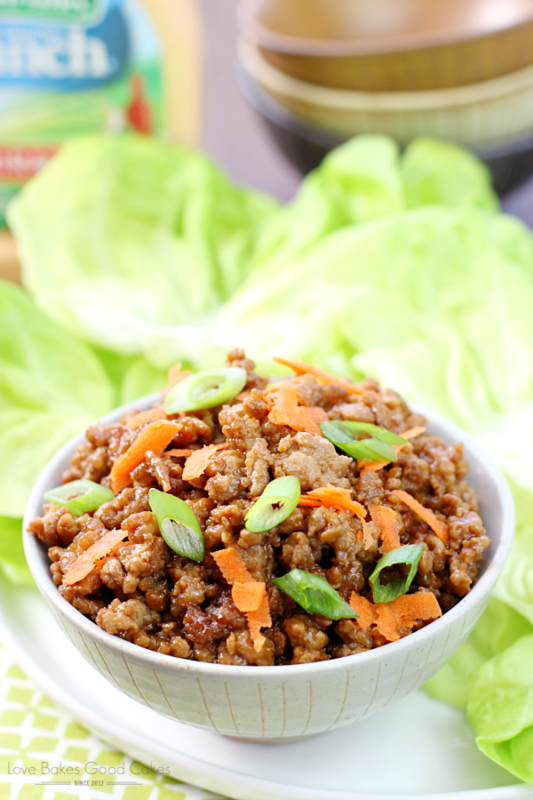 Get dinner on the table in a jiffy with these Asian Pork Lettuce Wraps! 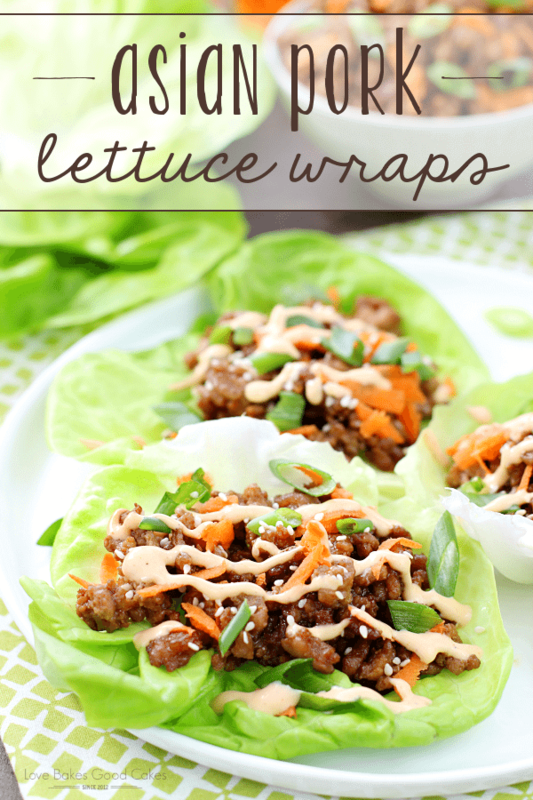 It's a simple, satisfying meal the entire family will enjoy! In a large skillet, cook and crumble the pork with the onion and garlic over medium-high heat until the pork is cooked through and no longer pink, about 4-6 minutes. Drain grease. Return meat mixture to pan. 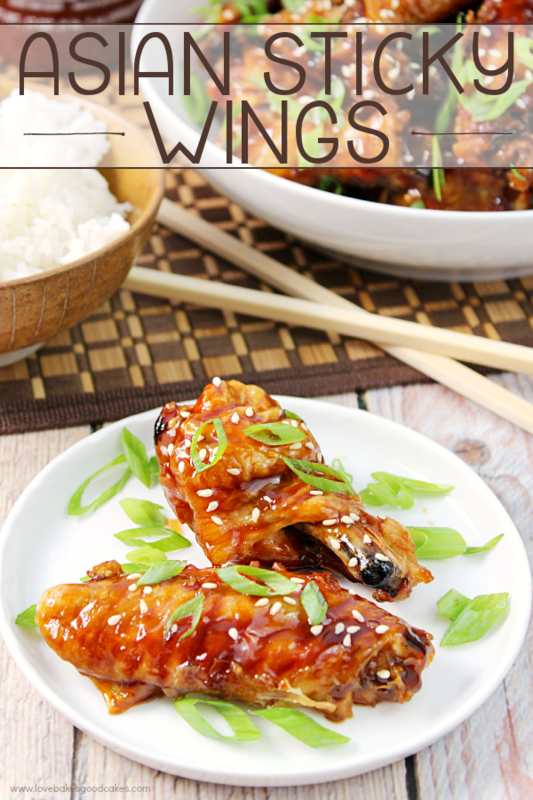 Stir in hoisin sauce, soy sauce, rice vinegar, ginger, Sriracha, and pepper. 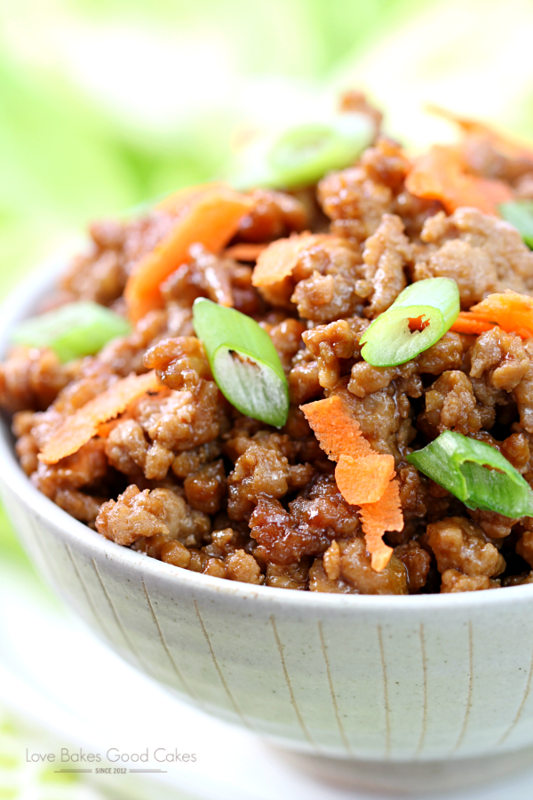 Cook, stirring frequently, over medium-high heat until the sauce thickens and the pork is coated, about 3-5 minutes. 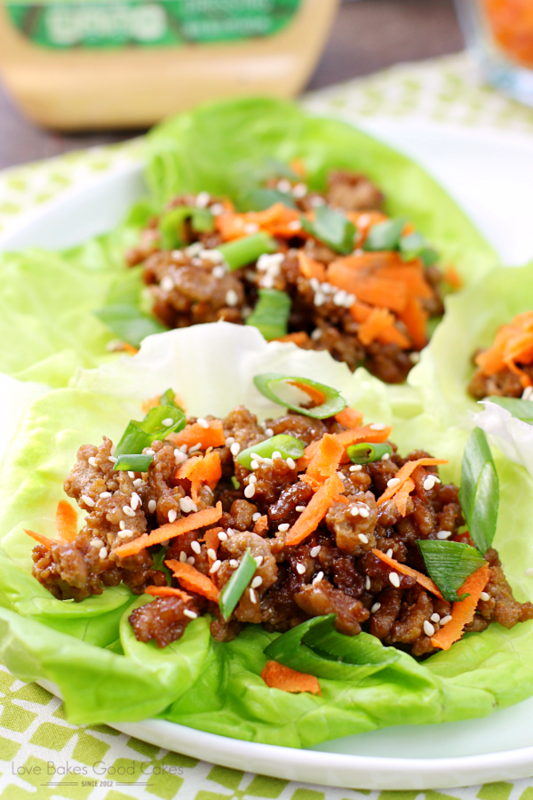 Spoon pork mixture into lettuce leaves. Top with green onions and carrots. 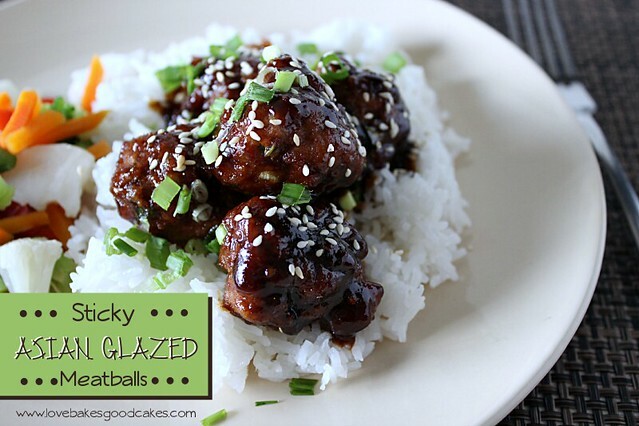 If desired, sprinkle with toasted sesame seeds. 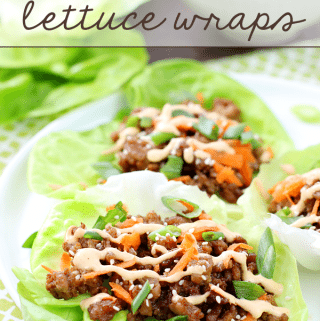 Drizzle Hidden Valley® Ranch Sriracha dressing over each wrap. Serve immediately. 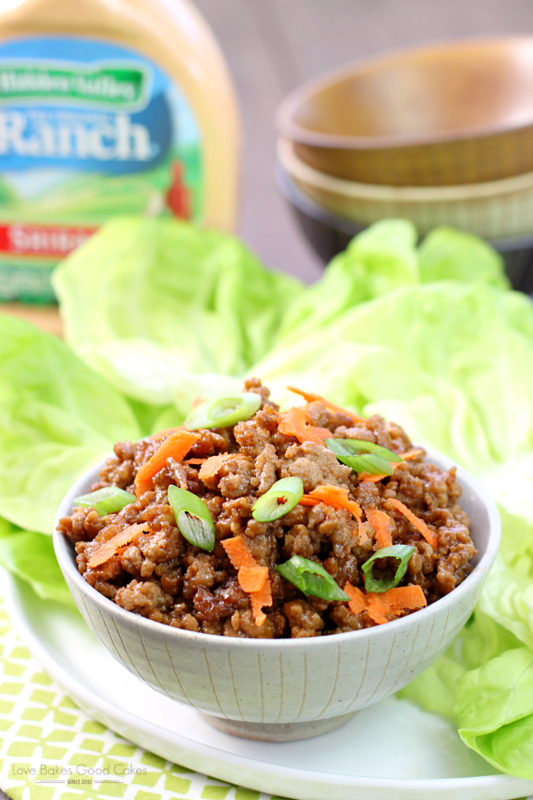 This Asian Pork Lettuce Wraps recipe is one of my family’s favorite quick and easy weeknight meal ideas – and the addition of Hidden Valley® Ranch Sriracha really kicked it up a notch! What is one of your favorites?! Feel free to leave a comment letting me know!